GOES-N was launched aboard a Boeing Delta IV-M+(4,2) rocket, flying from Space Launch Complex 37B at the Cape Canaveral Air Force Station. The launch occurred at 22:11:00 GMT on 24 May 2006. The launch had been delayed significantly due to a number of issues. 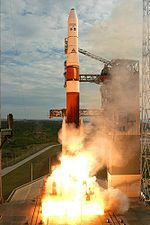 First, it had been scheduled to fly on a Delta III, but after three consecutive failures on its first three flights, the Delta III was cancelled, with GOES launches being transferred to the Delta IV. Further delays were caused after the previous Delta IV launch, the maiden flight of the Heavy configuration, suffered a partial failure. Then, two launch attempts in August 2005 were scrubbed, the second attempt just four minutes and twenty six seconds prior to liftoff. After these launch attempts, the rocket's flight termination system batteries expired, requiring replacement. A strike by workers at Boeing subsequently pushed the launch back to May 2006. At launch, the satellite had a mass of 3,133 kilograms (6,907 lb), and an expected operational lifespan of ten years, although it carries fuel for longer. It was built by Boeing, based on the BSS-601 satellite bus, and was the first of three GOES-N series satellites to be launched. It is currently in a geostationary orbit at a longitude of 60° West. In December 2007, it was called up to provide coverage of the east coast of the United States during an outage of GOES 12 due to a thruster leak. After the problem with GOES 12 cleared, it resumed operations, and GOES 13 was deactivated again. 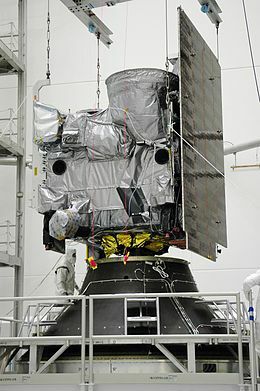 It was also briefly activated in mid May 2009, when GOES 12 developed another thruster problem, however it did not need to take over operations, and was deactivated by the end of the month. In April 2010, GOES-13 replaced GOES-12 as GOES-East at 75° West. GOES-13 served actively as GOES-East from April 2010 to December 2017. In December 2017, GOES-16 replaced GOES 13 as GOES-East. On December 14, 2017, GOES-13 direct GVAR was disabled. GOES-13 GVAR and LRIT were relayed through GOES-14 until January 8, 2018, at which time the GOES-13 GVAR relay through GOES-14 GVAR was disabled. GOES-13 ceased transmitting data on January 8 and began drifting to its storage location at 60 degrees west on January 9. The satellite arrived at 60 degrees west on January 31. In December 2006 GOES-13 observed a solar flare so intense it damaged its Solar X-ray Imager (SXI). On September 12, 2012, GOES 13 began to return images with an excessive amount of noise. The noise gradually increased to the point at which the satellite was placed in standby mode on September 24 in order to allow engineers to diagnose the problem. GOES 15 temporarily provided backup imagery for a short time, with GOES 14 being taken out of in-orbit storage and prepared to be a longer-term replacement including movement towards the 75 degree slot normally occupied by GOES East. GOES 13 returned to normal operations on October 18, 2012. GOES 14 was kept in normal operations and used to monitor Hurricane Sandy in parallel with GOES 13 before GOES 14 returned to standby status. At 03:40 UTC on May 22, 2013 GOES-13 was apparently hit by a micrometeorite or orbital debris (MMOD) which caused it to lose track of the stars that it uses to maintain attitude. The satellite then went into safe mode and shut down all of its instruments. The hit was believed to occur on the solar array yoke. In the short term GOES 15 was reconfigured to cover the entire United States, but operators activated GOES 14 to take over GOES-East operations at 06:00 UTC on May 23. GOES 13 was scheduled to return to operational status at 15:45 UTC on June 6, 2013 However that was delayed due to a Critical Weather Day and Tropical Storm Andrea. It returned to full duty on June 10th, 2013. On 20 November, 2015, at 0922 UTC, the GOES-13 Sounder experienced an anomaly. GOES Engineers determined that the Filter Wheel had stopped moving (the filter wheel aligns the infrared detectors with the incoming data) so data were not scanned. All 18 infrared channels were affected; the visible channel (band 19) continued sending usable data until the instruments were shut down in 2018. ^ "GOES-NEWS". NASA. 2009-05-09. Retrieved 2009-07-08. ^ a b Clark, Stephen (20 December 2017). "NOAA's GOES-16 weather satellite declared operational". Spaceflight Now. Retrieved 27 December 2017. ^ "Farewell to GOES-13: The History of NOAA's Former GOES East Satellite | NOAA National Environmental Satellite, Data, and Information Service (NESDIS)". www.nesdis.noaa.gov. Retrieved 2018-01-10. ^ "Farewell to GOES-13: The History of NOAA's Former GOES East Satellite". Retrieved 11 January 2018. ^ McDowell, Jonathan. "Launch Log". Jonathan's Space Page. Retrieved 2009-07-08. ^ "GOES-NO/P/Q — The Next Generation" (PDF). NASA. 2001. Archived from the original (PDF) on 2009-03-20. Retrieved 2009-07-08. ^ Kelly, John (2006-05-22). "For Boeing, Next Delta 4 Rocket Launch Carries More Than a Satellite". Space.com. Retrieved 2009-07-08. ^ Bergin, Chris (2005-08-16). "Delta 4 launch scrubbed - again". NASASpaceflight.com. Retrieved 2009-07-08. ^ "Mission Status Center". Delta Launch Report - GOES-N. Spaceflight Now. Retrieved 2009-07-08. ^ "Boeing's Launch Schedule Hit by Impending Union Strike". Space.com. 2005-10-27. Retrieved 2009-07-08. ^ Krebs, Gunter. "GOES N, O, P, Q". Gunter's Space Page. Retrieved 2009-07-08. ^ Wade, Mark. "HS 601". Encyclopedia Astronautica. Archived from the original on 2009-08-02. Retrieved 2009-07-08. ^ "GOES 13 Spacecraft Status Summary". NOAA. Archived from the original on 2011-01-13. Retrieved 2009-07-08. ^ "GOES-N Status". NOAA. Retrieved 2009-07-08. ^ "NOAA continues weather satellite discussions with the Air Force". Retrieved 12 February 2018. ^ "GOES-16 DRIFT AND TRANSITION TO OPERATIONS". Retrieved 13 February 2018. ^ "A Super Solar Flare - NASA Science". nasa.gov. ^ "Using polar-orbiting satellite data to help fill in gaps during a GOES-13 outage". University of Wisconsin-Madison. ^ Back from the dead: GOES-13 satellite returns to active duty, Washington Post. ^ "GOES 13 spacecraft status". NOAA Office of Satellite Operations. Archived from the original on 2011-01-13. ^ "Hurricane Sandy Life Cycle from GOES-13 and GOES-14". University of Wisconsin-Madison. ^ Watts, Anthony (17 June 2013). "NOAA GOES-13 satellite becomes first ever to recover from a micrometeoroid impact". Retrieved 6 April 2018. ^ Lindstrom, Scott. "GOES-13 Sounder Anomalies". Retrieved 27 December 2017. This page was last edited on 3 September 2018, at 12:11 (UTC).